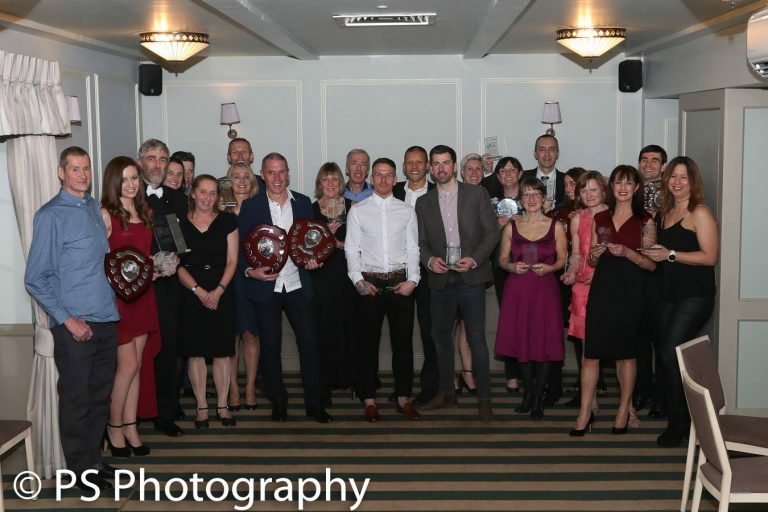 After an amazing year BRIAN WHITE was awarded Club Champion and Spartan of the Year at Fairlands Valley Spartans presentation evening, dinner and disco on Friday evening. SUZY HAWKINS was women’s champion for 2017. In the Male Open Short Distance Championship CRAIG HALSEY beat SIMON JACKSON by a margin of 1.8% (78.6% to 76.8%). GRANT RAMSAY was third with 75.3%. Short distance awards are for the best three performances out of 1500 metres, 5 kilometres, 5 miles and 10 kilometres. Age grading recognises those who keep running into their 40s, 50s, 60s, 70s and maybe beyond. In the Male Age Graded Short Distance Championship BARRY OSBORNE won by the narrow margin over 0.3% (85.7% to 85.4%) over BRIAN WHITE. JOHN HARRIS was third with 81.9%. Turning to the women ALISON WOOD won the Female Open Short Distance Championship with 73.3%; SUZY HAWKINS was second with 69.3% and ISABEL GREEN third with 65.7%. Age Graded JULIE SIMMONS won with 79.4% followed by IRIS HORNSEY 77.8% and CATHY CRAIG on 70.3%. Moving up to the long distance Male Open Long Distance Championship CRAIG HALSEY won with 78.9%; GRANT RAMSAY was second with 76.2% and JASON ANDERSON third with 72.1%. Long distance awards are made for the best three performances out of 10 miles, half marathon, 20 miles and full marathon (26.2 miles). Age Graded Brian White was the clear winner with 81.6% with PETE SMITH edging out STEFFAN FORD by 73.2 to 73.1% for second place. SUZY HAWKINS followed up her second in the short by winning the Female Open Long Distance Championship with 68.3%. NICOLA KENNEDY was second on 63.1% and ISABEL GREEN third on 61.4%. Age Graded CAROL PAUL won with 66.3% with JAN FRY and CATHY CRAIG having a tussle for second with 63.9 and 63.8%. Combining the long and the short Brian White was the overall male champion and Suzy Hawkins the female champion. Either a woman or a man can win the overall club championships but for 2017 it went to Brian White. STUART HAYCROFT was the most improved man over 2017 with CRAIG HALSEY second and RICHARD KENNEDY third. RUTH REILLY was the most improved female with JO BOWDERY second and CLAIRE HYDE third. The Spartan Photo of the Year was submitted by TIM SABAN. The club participation award went to SIMON JACKSON with ten out of ten. CLAIRE EMMERSON and SHARON CROWLEY tied as top women with eight out of ten appearances in league events. The President’s Award went to the Crowley Family – Sharon, Mike, Elizabeth and Nicholas – for their consistent help at events such as the Relays in the Park, Mid Week League, Cross Country League, Fairlands Valley Change and Stevenage Half Marathon over many years. The Spartan of the Year is voted by club members. After his huge successes and encouragement as a club coach BRIAN WHITE was nominated. The national cross country championships are an amazing event to take part in. More than 2,300 men and 1,100 women attacked the first hill from the Lido in Parliament Hill Fields on Saturday. This year twelve Fairlands Valley Spartans raced, six women and six men and the club finished with counting teams in the men’s and women’s events – a tremendous achievement. The women were first off at 2.20p.m. for their eight kilometre race and 44 minutes 27 seconds later LAUREN ING was over the finish line; soon HAZEL SMITH was back in 45 minutes 6 seconds. SHARON CROWLEY came back in 50 minutes 49 seconds with a smiling PENNY SCHENKEL just 20 seconds behind in 51:09. Next came PETA WILSON in 55:49 with CALLIE CHAPMAN not far behind in 56:47. At 3p.m. the men set off for their 12 kilometres of hills and gooey mud. DAVID RIDDELL got round in an excellent 56 minutes 15 seconds and TODD GRAY also beat the hour with 57:18. THOMAS SAUKA was back in 1:02:18. Then came the three Spartan Musketeers. Despite TIM ROBINSON doing a spectacular muddy roll at five kilometres, JIM BROWN sliding off course and the general effort of it they with PAUL WHYTE kept together and joked, shouted and encouraged each other round and then managed a sprint finish to entertain the spectators. Paul was 2,289th in 1:19:41; Jim 2,290th in 1:19:43 and Tim 2,291st also in 1:19:43. Six finishers needed and six Spartans in. Fantastic taking part in such a prestigious event. The standard at the fast end was incredible with the women’s race won in 28:33 and the men’s in 39:35. A great day out. Clearly needing no rest the Three Musketeers were out again on Sunday but this time they were five and it was the Baldock Beast Half Marathon. JIM BROWN, ERICA GRAYSON, KAREN PALMER, TIM ROBINSON, PAUL WHYTE were together from the start, tackling the cold headwind. Tim dropped off the pace a bit after a cross country section on icy patches around Sandon and Rushden but the others kept a steady rhythm going with good humour which led to the unexpected bonus of Karen dipping under two hours with 1 hour 59 minutes 58 seconds at 251st place. Erica was soon over the line at 254th and 2:00:05. Jim was 250th in 1:59:56, Paul 253rd in 2:00:04 and Tim 266th in 2:02:50. Nearer the front NATALIE LAWRENCE was second woman, and 40th overall, in 1:34:06; KATY JINKS 171st in 1:50:10; LISA BURGESS 187th in 1:52:15 and CLIVE CANNON 203rd in 1:54:37. KARTIK SHARMA was 318th in 2:12:22. On a lovely bright but cold morning women’s captain CLAIRE EMMERSON ran the Tarpley 10 miles around the villages near Bury St Edmonds. Her time was 1:18:54 a new personal best by over 3 minutes. MADDIE PRITCHARD ran the Brighton Half on Sunday in 1:41:58, CLAIRE HYDE beat two hours with 1:58:57 and MARIE HARVEY came in with 2:21:49. STUART ARCHER ran the Hillingdon Half Marathon and beat 90 minutes with what would have been a new personal best of 1 hour 29 minutes 42 seconds but unfortunately there was a problem with the course measurement. Not starting until 6.30p.m. DAVE BOWKER ran in the 3,000 metres at the Lee Valley Indoor Championships. He finished in 11 minutes 40 seconds. A relatively quiet week of parkrunning with some Spartans no doubt nursing hangovers, facing the National XC championships that afternoon, the Baldock Beast the following day or maybe even all three! At Stevenage CRAIG HALSEY was first over the line in a new course PB of 16:47. DANNY SCANLON was 6th in 19:33 and MARK BEASLEY had a top 30 finish in 22:16. For the women KELLY EVANS was first Spartan finisher, 12th in 26:09, with VERITY FISHER 25th in 27:44 and SALLY PHILLIPS being third Spartan woman in 33:23. There was also a new course PB for STEVEN DOBNER (28:40), and LORRAINE SAUNDERS completed her first parkrun in 33:51. Elsewhere DAVE SMITH was one of the runners to test the new trial course at St Albans as they look to find a way to accommodate the growing numbers running there and MICHAEL O’KEEFE went to Bedford, while TIM SABAN, RUTH REILLY and ANDY JAY headed to Panshanger and JOHN ROXBOROUGH to Great Denham.